NEWBURGH—The City of Newburgh hosted the first Hudson Valley Vegan Food Festival Aug. 14. In the midst of the heat wave that overtook much of the northeast this weekend, people made it out to sample vegan offerings by vendors from the Hudson Valley and beyond. 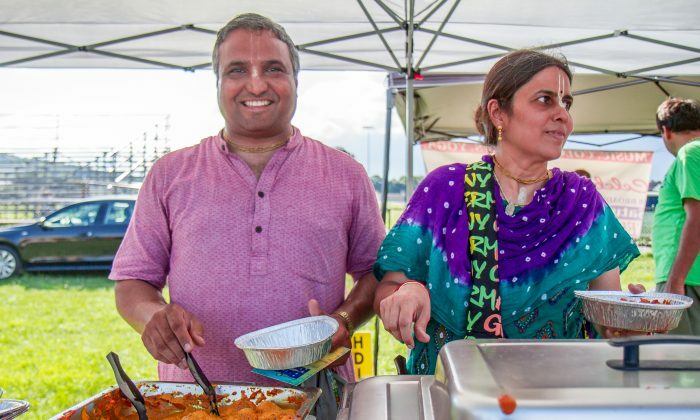 The football field of the Delano-Hitch Recreation Park was host to a few dozen vendors selling smoothies, plant-based hot dogs,vegan Indian food, and other vegan food options, while also showcasing crafts and clothing that fit the vegan theme, and vegan-friendly organizations in the Hudson Valley. The event’s organizers are two young, local entrepreneurs. Both Newburgh natives, Kyla El and Sam Simmons are 23 and 30 respectively. They originally had the idea of gathering friends together for a vegan barbecue with two vendors. The idea gained popularity and soon grew into a food festival open to the public. And when local vegan restaurant Nimai’s Bliss Kitchen agreed to be the main food sponsor, the event was suddenly much larger. Nimai’s Bliss Kitchen is a 2-year-old Newburgh-based vegan Indian restaurant on Robinson Ave. It was easily the largest, and one of the busiest, food stands at the event. The owners of the restaurant encouraged Simmons and El to promote the event as the Hudson Valley Vegan Food Festival. “It went from backyard barbecue to literally Hudson Valley Vegan Food Festival,” said El. It went from backyard barbecue to literally Hudson Valley Vegan Food Festival. The pair met through mutual friends and connected through veganism. Simmons was transitioning to a fully vegan diet, and El, who runs a wellness and career coaching company, helped him through the process. El’s company EL’evations does vegan food planning and delivery. Simmons, who also goes by SES DA Great, co-owns TRUSIC Music, LLC. He converted to being fully vegan after he lost his grandmother to diet-related illnesses. He was also seeking more energy to help deal with an intense work schedule. “The main reason why I wanted to be a vegan is for health reasons. I lost 35 pounds since I’ve been vegan. I feel the greatest I’ve ever felt in my life. I’m clear, focused, energetic. It was a no-brainer,” said Simmons. That was also the motivation for the proprietors of Nimai’s Bliss Kitchen. Another popular booth at the festival, Yeah Dawg, grilled soy free, plant-based hot dogs over a portable grill. They had an array of colorful toppings and long line of people queued up to try them. Yeah Dawg is a pop-up, hot dog shop that traveled all the way up from Brooklyn to take part in the festival. The owner, Marina Benedetto, decided to make healthy, classic American food after working as a chef and counselor at a homeless shelter, according to Yeah Dawg’s website. The dogs are made of a combination of gluten-free flours, root vegetables, sunflower seeds, herbs, and spices. As far as where people can go out to eat vegan food in the Hudson Valley, El and Simmons stressed that options are few and far between.